Abingdon Virginia | We Scream, You Scream, Abingdon Ice Cream! We Scream, You Scream, Abingdon Ice Cream! Ice cream is a great treat anytime of the year, but in the summer months ice cream holds a special place in the hearts of kids and adults. Abingdon is chock full of family-owned ice cream eateries that cater to tastebuds of all kinds and all ages. 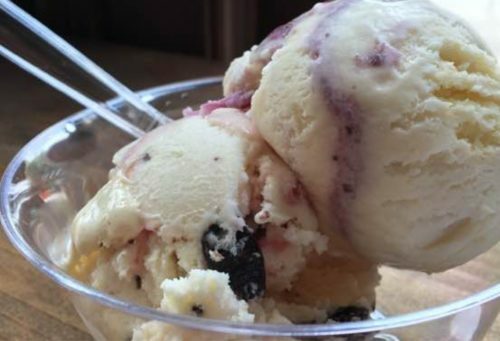 During the Virginia Highlands Festival take a break from the heat and chill down in one of these unique ice cream shops on or near Main Street. The Ice Cream Stop is a hidden gem that’s a favorite with locals. With over 15 different flavors and plenty of options, you can create your perfect custom ice cream cone! A drive through also offers ice cream if you’re on the go. Abingdon’s newest frozen dessert shop serves 24 different flavors of frozen yogurt and 41 types of toppings. Just start with your own bowl and fill it up with hundreds of different combinations of frozen flavors to ward off the hot days. Fresh-baked, home-style desserts, just like grandma used to make, plus homemade icecream and italian ices. Try seasonal varieties like strawberry and peach. Come for the sweets, and stay for the casual, welcoming ambiance and free wi-fi, plus a selection of favorite board games in the lounge. This elegant shop offers house-made ice cream, coffee, and a multitude of baked goods like cookies, brownies, crème brulee and cheesecake. Walking into Anthony’s Desserts, you can smell all of the amazing things being cooked in the kitchen. Each week they create homemade ice cream in house with no preservatives or artificial coloring. selections change every week. Located in one of Abingdon’s historic buildings on Main Street, Camella’s has been transformed into a tea parlor and ice cream shop. Upon entering the adorably quaint shop you’re immediately pulled back in time to a more genteel era. This funky, eclectic gift shop sells gifts, yard art, collectibles and more, plus a selection of homemade gelato and sorbetto. If you are in the mood for even more sweet treats, grab a bag of retro candies by the pound to take home with you.